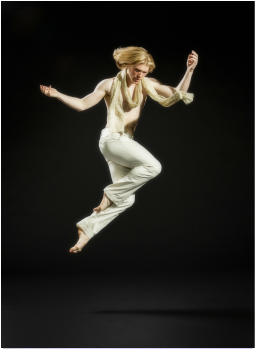 Josh Murry began dancing at local studios on the Oregon coast when he was 12. Taking from everyone and everywhere he trained at Maddox Dance Studio (Jeanne Petersen), Encore Dance Studio (Denele Sweet), and Astoria School of Ballet (Maggie Wall) to name a few. As a teenager he attended summer intensives at Milwaukee Ballet in Wisconsin and Joffrey Ballet in New York on full scholarship. He was then scouted for Brigham Young University's Theatre Ballet Company. He was a full time student and dancer doing full length ballets, composition pieces and senior projects getting attention and recognition from dance department professors. Deciding that school could wait he moved back to the coast and joined BodyVox-2 in 2009. In his time with BodyVox he has performed in 6 world premiere shows, "Smoke Soup," "BloodyVox," "A Soldier's Tale," "The Cutting Room," "Firewall," and "Cosmosis" as well as BodyVox classics such as "Reverie," "Thousand Little Cities," "Horizontal Leanings," and "Fifteen." He became a leading artist with the company, touring all over the nation as well as Europe. Josh was instrumental as part of the company's education and outreach program, developing and performing in specially designed school programs for thousands of students throughout the Pacific Northwest. Currently Josh is a freelance dancer, teacher, and choreographer in the greater Portland area.